The South Street Seaport businesses are slowly coming back to life, but there are still many that are closed for good or still under construction. Along Front St. are many eateries that have managed to reopen. Some got lucky because they are raised up off the street, while others like Barbarini Alimentari struggled. News came that the dual owners had parted ways, but one opted to reopen Barbarini as Barbalu. The menu is somewhat the same with reasonably-priced sandwiches and more expensive pastas. They had good food before and I had faith that the sandwiches would remain tasty. I was right. 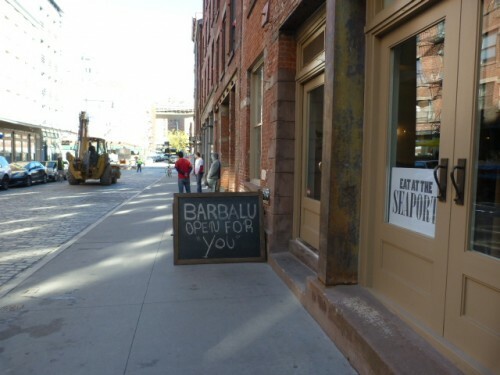 Posted by Andrea H at 10:00 am, November 7th, 2013 under Barbalu, Italian, Sandwiches, South Street Seaport.